Designed by OFRF, the authentic nexMESH Coil is three times as dense as the Wotofo Mesh Style Coil, it comes with lower 0.13ohm resistance to support higher wattage devices, perfect for sub ohm vaping. The uniform mesh weave with 3x more holes delivers rapid power transfer for lightening fast heating. 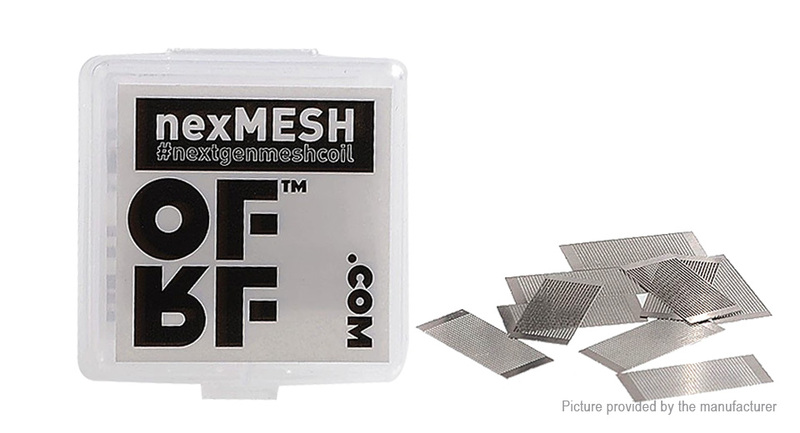 The unique triple density mesh netting maximizes heating surface area to deliver thicker vapor and intense flavor, and the e-juice spit-back situation is significantly decreased. It is suitable for Wotofo Profile RDA and other RDA that use mesh wire, such as Vandy Vape Mesh RDA, Vandy Vape Mesh 24 RTA, Vandy Vape Lit RDA, Digiflavor Mesh Pro RDA, Digiflavor Themis RTA (Mesh Version), Vapefly Mesh Plus RDA, Cthulhu Iris Mesh RDA, etc.